So, today marked my third and (for the moment) final workout session with Tammy, my personal trainer. I will meet with her again in 6 weeks to modify my workout so my muscles get confused, and I don't get bored. I wanted to share with you guys my numbers on various exercises that she has me do. This will help me track my progress later as well as share with you guys a bit of what I do at the gym. 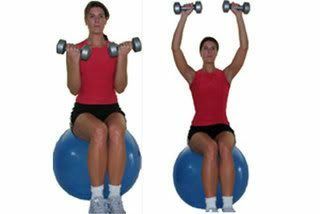 :) All of these exercises are strength training (whether weight lifting, ab/core exercises or general stuff using my body weight and a piece of equipment such as a bosu ball.) I'll post some visuals (found by google searching the exercise) so you know what they are. I couldn't really find a picture for this one. So, I basically stand like she is, except with one leg off to the side. 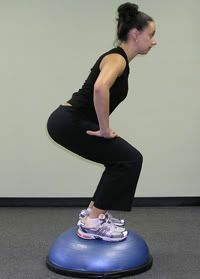 Then I push up and kick the leg on the floor to my side, and come back down to the squat pose. 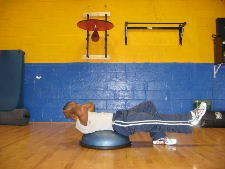 Bosu 1/2 bicycle = 15 reps on each side. I HATE these. Oh, and I don't put the ball out like that, I just hold it by my chest to keep better form and balance. This one, she said if I could do 4, she'd be happy. Boo-yah! I don't really like this photo. 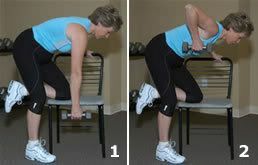 I start with the dumbbells lateral to my shoulders, just above the shoulders, and then finish sort of like she does, except I bring the dumbbells all the way up to nearly touching on the ends. This one makes me feel the weakest. Oh, and I use a bar, not the weird twisty bike handle lookin' things. I do this, but not the twist portion. This one starts in this position, then you roll your knees in underneath you, and then roll them back out while keeping your arms and body stationary. Ouch! This is the closest photo I could find. Basically I'm laying on the foam roller like he is except with my feet on the ground. And instead of holding another foam roller, I'm holding a mini ball. 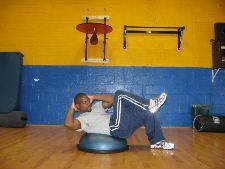 From there, I lift my shoulders and head off of the foam roller while extending the ball out toward the ceiling. Wow, I can definitely do some of these! Others, not so much... Thanks! It looks like a really good workout! Hi there, just found your blog via the bajillion other weight loss blogs I read! I know that annoying advice is a natural byproduct of being public about weight loss, and everyone thinks that their method of success should be your method of success. That said, I do have some potentially annoying advice to offer :). First of all, your trainer is having you do very high reps. 5-8 is considered low, 8-12 average, and 15-20 high. 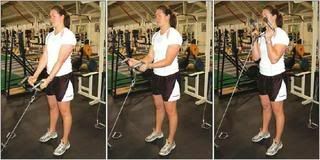 It was a popular idea a while ago that lighter weight with more reps was better, but that theory has largely been debunked. Unfortunately in my experience, most trainers are underqualified and not up on the latest research. 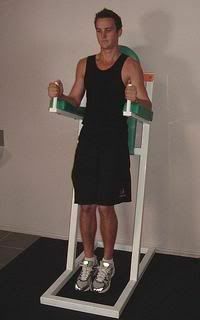 For that reason I am self taught with weight training using www.stumptuous.com, a well respected resource for women. 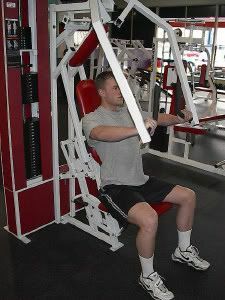 The other reason I wonder about your trainer is the inner and outer thigh machines. 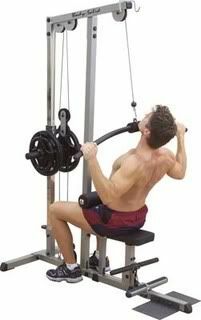 Those machines are useful IF you have a specific need to strengthen those muscles, such as if you rode horseback. But for a normal person, those machines are working a small muscle that you have no need to focus on. 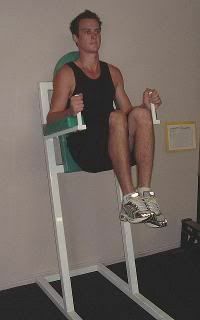 I used to use them because I still believed that "firming up" those muscles would in turn firm up my thighs. That is a myth, called "spot reduction." Your body will lose fat however your genes dictate. Crunches won't shrink your belly, thigh machines won't shrink your thighs. When you lose overall body fat you have no control over when or where you lose. Weight training can preserve muscle, increase strength, and boost metabolism, but it won't change the shape of your body. Losing fat will. Again, I hope this was more useful than annoying. I did a lot of the same things early on myself so this is in the hopes that others can learn from my mistakes.